"You can cry about it or do something about it." Ten days before she was to compete in trials to qualify for the 2016 USA Paralympic team, Cassie Mitchell was in the hospital recovering from pneumonia, tachycardia, and shingles, all side effects of the chemotherapy she was getting to treat chronic myeloid leukemia (CML). Although Mitchell has faced down health problems her whole adult life, she admits she had a moment of doubt. At age 18, Mitchell was diagnosed with neuromyelitis optica (Devic's disease), an autoimmune disease of the central nervous system that paralyzed her from the waist down and continued to cause additional upper body and eyesight impairments. She focused energies on college, took up wheelchair sports, and went on to get her doctoral degree and become a research faculty member in the Coulter Department of Biomedical Engineering at Georgia Tech and Emory. At the same time, the consummate athlete has been racking up world records in track and field events. 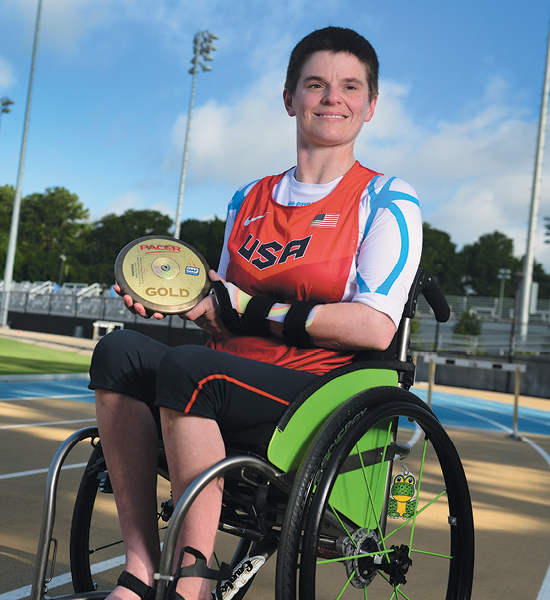 Despite the leukemia diagnosis in April, she was determined to compete in the 2016 Paralympics. She says her doctor, Winship hematologist Vamsi Kota, supported her. "I know he has my health as the number one concern, but he also respects my athletics," says Mitchell, who thanks her entire health care team for their care and encouragement. Mitchell wore the USA colors to Rio in September and came home triumphant: a bronze medal and personal best in the club throw, and a silver medal and personal best in discus throw. "Everybody has a tree story." 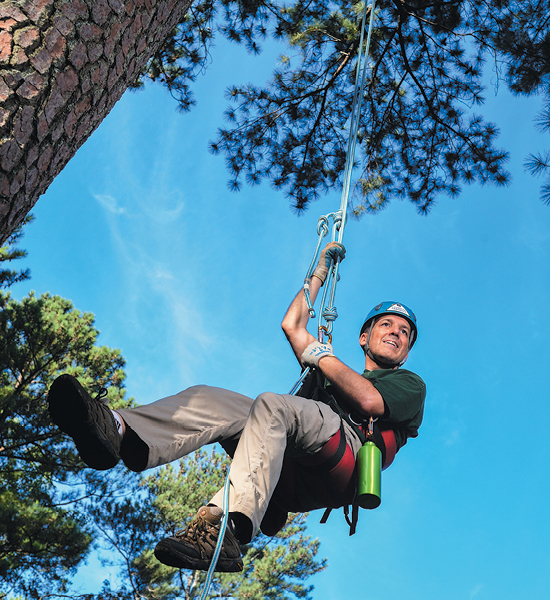 Neil Norton's tree story is about how his life changed course on March 19, 1998—the day he received a bone marrow transplant. cure and, luckily, an unrelated donor match was found through the bone marrow registry. Still, recovery was long and rough. His wife Lynne was constantly at his side and Winship nurses kept encouraging him. One nurse in particular urged Norton to think of a positive mental image that would help him heal. Norton had always loved trees, so he imagined the new cells taking root in his bone marrow, growing like a tree. He spent weeks in the hospital imagining trees and after getting out, he turned the images into reality by becoming a certified arborist. Now he spends his days looking long and hard at trees, seeing what most of us miss and, in his words, "staying rooted." "I prayed for strength and God was listening." Walter Hawkins thought he might never walk again. The 30-year Navy veteran faced his stage IV lung cancer diagnosis head on and was determined to keep fit throughout treatment, but in December of 2015, a few months after surgery to remove a tumor on his spine, a compression on his spinal cord paralyzed him from the waist down. Undaunted, Hawkins threw himself into rehab, first pushing himself through the hospital hallways in a wheelchair and later walking with canes. Discipline and setting goals have served Hawkins throughout his life. 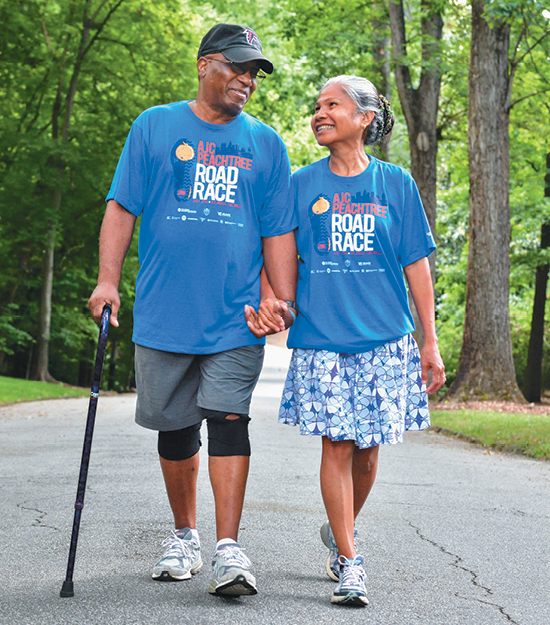 So, with encouragement from his surgeon Daniel Refai and oncologist Rathi Pillai, he set his sights on walking the Peachtree Road Race in July. Training with his wife Paulina, he worked his way up half-mile by half-mile until he could walk a full 10K (6.2 miles) without stopping. On July 4th, Walter and Paulina finished the race together. Hawkins says Paulina and his doctors have been with him every step of the way: "They don't have 'quit' in them." "Cancer taught me how quickly life can change." Emily Schillinger was just 14 years old when she was diagnosed with an ovarian germ cell tumor. Over the next year, she was in and out of Emory University Hospital receiving treatment from Winship doctors. High-dose chemotherapy was followed by a stem cell transplant at Children's Healthcare of Atlanta. Now, more than 20 years later, she has no evidence of the disease. 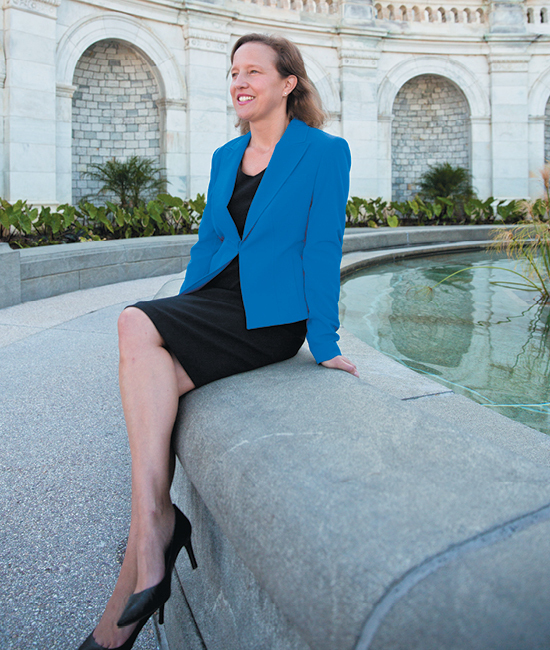 After college, Schillinger moved to Washington, DC, and worked with some of the most powerful people in government. She served in the White House press office during the Bush administration, was press secretary to former House Speaker John Boehner, and is now communications director for the House Ways and Means Committee. "Cancer will shape you forever, but it doesn't have to define you for the rest of your life," says Schillinger. "Every year you are blessed to stay healthy is another year you can create something new and change your life in enriching, unexpected ways." Schillinger and her husband, Ian, are planning to adopt a baby. 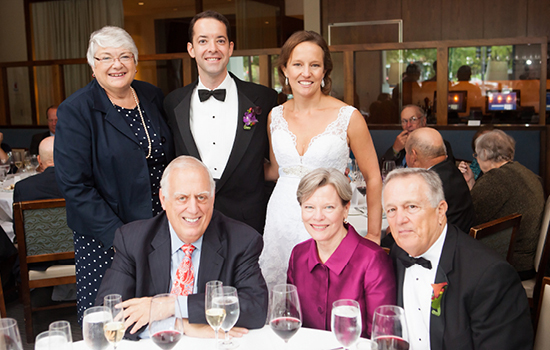 Winship Survivorship Program Director Joan Giblin (standing far left) attended Schillinger's wedding three years ago. Seated are (left to right) Schillinger's oncologist, William McGuire, mother Cindy Lawrimore, and father Marshal Lawrimore.